It was just a week ago that Brexit, the impending disaster that is Britain’s decision to leave the European Union, seemed like it would just remain in the realm of fantasy. After all, there was no way that the rampant obfuscation of facts, like how much money Britain was “sending” to the European Union every month, would go over in the land of Sherlock Holmes (or whichever perspicacious fictional Brit you want to invoke). But the naysayers turned out to be wrong, and it’s time to deal with the fallout. 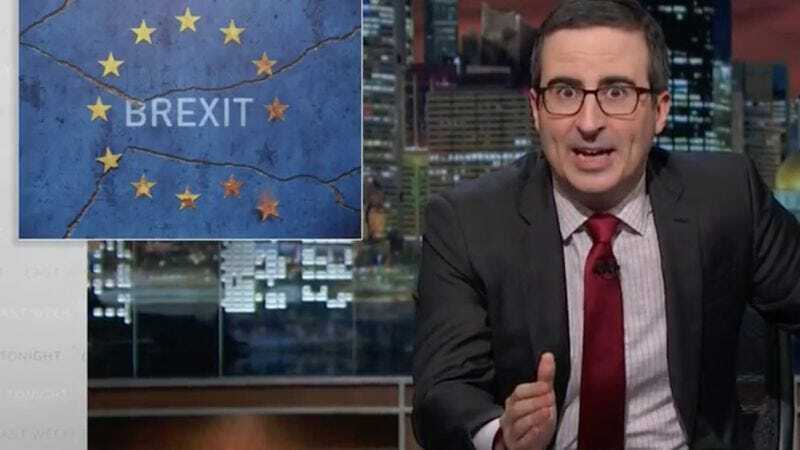 In the first segment on last night’s episode of Last Week Tonight, John Oliver took his homeland to task for letting a Punchable Face cover model and a “shaved orangutan with Owen Wilson’s hair” lead them to leave the European Union. And some “leave” voters are already regretting their decision, admitting to feeling duped by “Leave” campaigners Nigel Farage and Boris Johnson. Although the extent to which one of Oliver’s now-signature apoplectic videos would have affected the vote can’t be known, it is worth noting that his first Brexit segment, which originally aired on June 20, was not shown in the U.K. until after the referendum vote. Maybe if everyone had been whistling his obscene new British anthem, they would’ve been happier to stay put.